Following the events of “This Place is Death”, a time jump briefly brings the remaining group of survivors — James “Sawyer” Ford (Josh Holloway), Juliet Burke (Elizabeth Mitchell), Miles Straume (Ken Leung), Daniel Faraday (Jeremy Davies) and Jin-Soo Kwon (Daniel Dae Kim) — to a time when there is an ancient statue standing on the island. They are only able to see the back of it before John Locke (Terry O’Quinn) turns the wheel, bringing the survivors forward to 1974, at the peak of the Dharma Initiative’s presence on the island. Now that John has pushed the wheel, the time jumps have stopped and they are stuck in the past. The group comes across a pair of Dharma Initiative members who have been captured by some of the island’s native inhabitants, known as the Others. Juliet and Sawyer kill the two Others and free Amy (Reiko Aylesworth), but her husband has been killed. The group returns to the Barracks, where Amy resides; however, she tricks them into walking through the sonic fence which surrounds the Barracks, knocking them unconscious. Sawyer wakes up and is confronted by Horace Goodspeed (Doug Hutchison). Sawyer tells him that his name is Jim LaFleur and that he and the other survivors were part of a shipwreck on the island, and that they are still looking for other members of their crew. Horace informs him that they will have to leave the next day on the submarine because they are not “Dharma material”. That night, the spokesman of the Others, Richard Alpert (Nestor Carbonell), enters the Barracks to determine why his treaty with Dharma was broken. Sawyer convinces Alpert to not attack Dharma, because he is the one who killed the Others. Alpert is further convinced when Sawyer shares knowledge of the events that transpired in 1954 in the episode “Jughead”. 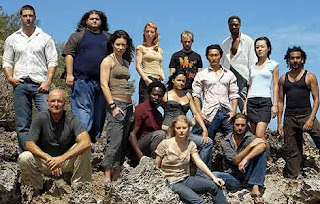 Because Sawyer has successfully defused the situation, Horace allows the group to stay and look for the other crew members of their ship, when in reality they are waiting for Locke to return with the survivors who left the island. Three years later, the survivors have joined Dharma and are living in the Barracks. Sawyer is the head of security, while Jin continues to search for those who left the island. Amy is pregnant with Horace’s baby and due to give birth in two weeks. When Amy goes into early labor, Juliet successfully delivers her baby. This causes distress for Horace, who believes that Amy is not yet over her deceased husband. Sawyer reassures him by stating that three years is enough time to get over someone, referring to his relationship with Kate Austen (Evangeline Lilly). Sawyer returns to his home, where he lives with Juliet, with whom he is in love. The next morning, he receives a call from Jin, who discovered Kate, Jack Shephard (Matthew Fox), and Hugo “Hurley” Reyes (Jorge Garcia) while driving a “new” Volkswagen bus at the end of “316″. Sawyer directs Jin to an isolated area so they can be reunited. That’s all we have for now on Lost LaFleur:Lost Season 5 Episode 8.